Vertigo call themselves a ‘fine dining experience’, but with a lunch tine offer of two courses for £10, I opted to give them a go and see the hype that surrounds this 5 floor venue. Located between Albert’s Square and Deansgate, the former Japanese restaurant of Ithaca has been going strong for a couple of years now, with head chef Ian Armstrong taking the reigns in the kitchen and supplying a menu of English cuisine to a modern decor setting. With a wine list that matches there offerings to the food menu, I opted for a glass of Aves del Sur ‘Golondrina’, a Merlot from the Maule Valley region of Chile (£4.50 175ml). Fantastic aromas of dark cherry that flows into a wonderfully smooth palate of dark fruits and subtle hints of soft vanilla. It created a long finish that softened surprisingly more when paired with the flavours of my Tomato Chicken and Chorizo Casserole with broad beans, peas and baby onions. Piping hot throughout with a simple yet thought out presentation, it was a dish that was perfect for a lunch time appetite. A Chocolate Sponge followed with chantilly cream and fresh cherries which emphasised the Chilean wine to a new degree and although small, its rich complexity makes up for it. The place itself, as mentioned, has a modern style to it, with velvet drapes hanging from the floor to ceiling windows which itself is entwined with diamond styled wall coverings. This gives it its fine dining experience, but not that ‘fake, tacky feel’ that can ultimately make or break some venues. Its attention to detail on the layout to the room itself, to the glassware on the tables, really makes you feel like you’re in a 5* hotel, with service to match. A knowledgeable server with enough talk to not only yourself, but to others gives that dining experience that most customers crave for, and ultimately expect. Ambient music doesn’t drown out his recommendations either, with daily soup and fish of the day well presented. Choices of starters including Watermelon and Feta Salad, Caramalised Baby Onion Tart and Tomato and Red Onion Bruchetta have you spoilt for choice, with main courses of Vegetable Rosti, Moules Marinier or a 6oz Cheshire Sirloin Steak to really get the taste buds going. A Raspberry Eton Mess, Fresh Fruit Salad and your traditional Cheese and Biscuits round off their Lunch and Early Evening menu, with the table next to me ordering the latter which although sounding average, looked fantastic. 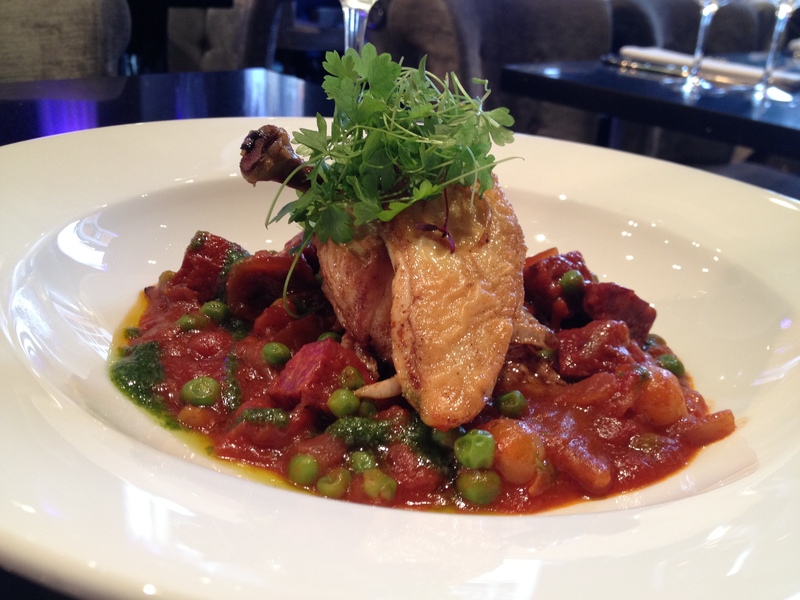 A thoroughly enjoyable lunch, with an offer that is certainly worth its price. I recommend highly. 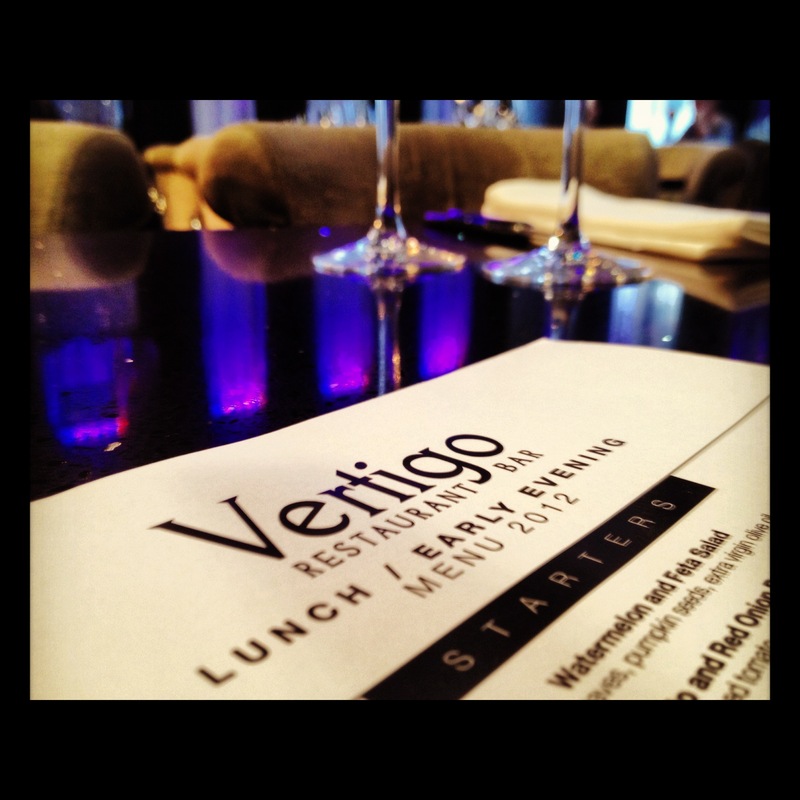 To book a table at Vertigo, visit their website here. Check out the rest of the photos from Vertigo via my Facebook page.